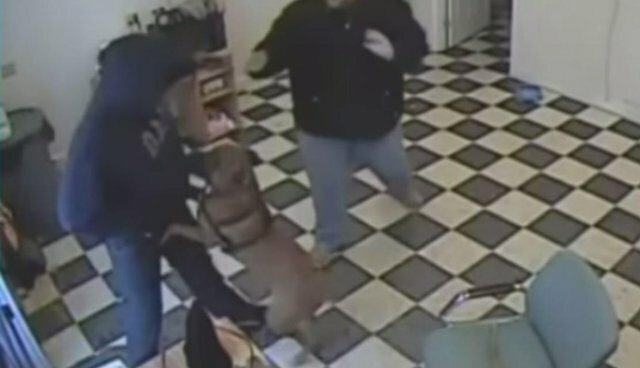 In a selfless act of bravery, one which reaffirms his title as "man's best friend," a courageous pit bull mix helped save his human during an armed robbery captured on film. Surveillance footage from Holly's Gas Station in Saco, Maine, shows employee Justin Ireland sitting in a back office with his loyal dog, Thor, resting at his feet. Off camera, a masked man enters the store carrying a gun and forces his way into the room where the pair had been sitting. The would-be robber's plans evidently didn't account for Ireland having such an unflinching ally to protect him, reports the Press-Herald. According to the Saco Police Department, Thor drove the assailant to flee the store, leaving him with a few painful reminders of his foiled robbery attempt. "[The] dog lunged at the suspect, biting him on each side of his face," police wrote on Facebook, adding that the suspect is still at-large. Fortunately, Ireland appears to have escaped the incident unharmed, all thanks to the quick-thinking actions of his hero - his dog.